What separates a Sphynx cat from other breeds of cats is the kindness and the love for human companionship. While other cats might not need to be around their human owners, Sphynx craves human attention and companionship. In addition, they are very active and playful, similar to a dog. Consequently, they need greater human attention and stimulation. With that said, here is what you should know about this unique breed of cats. Sphynx, as you may know it today, was originally a Canadian breed, which hails from a spontaneous genetic mutation. The relative hairlessness of your Sphynx comes from a genetic mutation present in them. In order to achieve the similar hairlessness, both parents need to have the hairlessness gene. Sphynx is a medium-sized cat with a wrinkled body. It weighs between 6 and 12 pounds, with females being smaller, and can be bought in nearly all colors and patterns, including pointed, solid, tortoiseshell and tabby. Their wrinkled face, large eyes and big ears give them the appearance of a wise and gentle alien, and its rounded belly will make it seem like he had just eaten a major meal. There is generally no problem in housing this breed of cats as they are often very content in the small houses. While they should not be exposed to the cold and sun for longer duration, this doesn’t mean that they should always stay home. They are most comfortable in a warmer house, with a temperature no less than seventy, and want to sit down on a sunny windowsill. If possible, allow them access to an area where they can sit near a window. In colder conditions, they might not be as comfortable. Sphynx that lack enrichment might feel lonely and will probably withdraw from interacting with people or objects that come in their contact. It’s important to provide your cat with extensive collection of toys, places to hide, sleep and perch and real life objects to scratch and play. It is also critical that cats have got a place they perceive as safe to nibble on, drink, and relieve themselves. This can be achieved by providing your cat with an environment that is full of cat trees, toys, cots, bags, perches and places the cat might trust for sleeping, eating and playing with the litter box. Sphynx cats love to eat! They love to eat often and try different things. To help your Sphynx have a healthy digestive system, it is recommended to feed them in small portions at regular intervals. Dry cat food is the most convenient and healthy option for your Sphynx. The dry cat food allows you to keep his teeth clean and gums healthy. When feeding dry cat food, it is necessary to provide the cat with more water compared to a situation where the cat is fed with wet canned food. Some cat owners swear by BARF diet. They believe that feeding cats with raw food brings about significant improvements in their appearance and overall wellness. Some have been so impressed with the results that they can never get back to feeding their cats with canned or dry food bought from supermarkets. Ahead of delivery, make certain that the Sphinx is living in a warm and cozy destination. Allow the cat to spend some time in such location before the delivery. After the delivery, make certain that the place is properly protected, cozy, neat and spacious enough to fit the mom and the kittens. No heavy disinfectants and detergents must be used, as they will irritate the cat's skin. Several weeks after birth and in some cases before, the kittens should be washed in warm water, while being careful that the warm water never gets in touch with their eyes. Keep the area well heated and provide the cat and kittens with thin blankets, if necessary. In addition to that, kittens must not be sold before 12 weeks of their delivery. Sphynx has a relatively higher body temperature - about 103 ? F. They have a thin layer of fur on their epidermis that may not be easily seen. 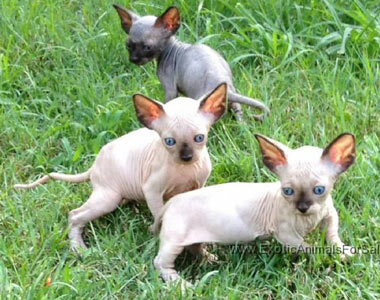 This gave rise to the popular misconception that Sphynx cats are hairless. Sphynx have a rather wedge-shaped, angular skull. The forehead is flat and the skull is not much wide. They have very apparent cheekbones and a distinct whisker area. Sphynx have incredibly large ears. They can be broader at the base and narrowing at the tip. The inside of the ears is hairless. The eyes are large and oval shaped, sloping upwards towards the ears. The hue is often in line with the coat; however, the eye color may also be blue, green and hazel. Their legs are proportional to the size of the body. In most cases, they are strong and muscular. Their hind legs can be a little longer than their front legs. The paw padding is generally very thick. The tail can be much like a whip, which implies that it can be thicker at the base and tapering to a fine point at the end. Some Sphynx cats have a puff of hair at the end of their tail, just like a lion. 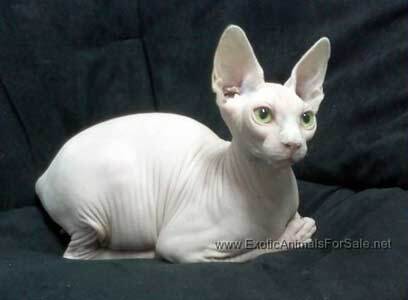 The Sphynx can be purchased in numerous colors with several different markings. However, a cat of this kind cannot be judged based on its color. One of the primary reasons for having the Sphynx cat is that it blurs the regular boundaries between dogs and cats. This really is a cat that will be loved by dog people. Their personality combines the best elements of dogs and cats to create an amazing pet that everyone will adore.